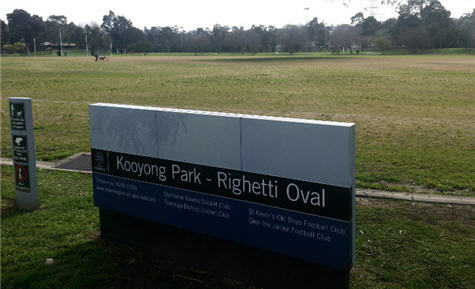 The Righetti Oval (pictured right) is located in the heart of the tranquil surroundings of Sir Zelman Park in Kooyong. The Prahran Cricket Club aquired use of this ground at the start of the 2013/14 Premier Cricket Season after crossing over from Como Park. The Prahran Cricket Club Third and Fourth Elevens can be found playing here each Saturday during the summer months whilst the Coles Myer Sharks and Prahran Ladies Second Eleven occupy use on a Sunday. The Oval known for its outstanding surface also backs up as an athletics track on Saturday Mornings with loads of families and their children making use of this popular facility. The well equipped pavillion which overlooks the ground boasts changing rooms with hot showers, umpires room and air conditioned dining room and kitchen. The Prahran Cricket is very grateful to the Stonnington Council and its summer and winter tenants for the opportunity. The ground is located in Elizabeth St Kooyong and Melways Ref 59 D3.